First, there is a negative scale effect, due to decreasing returns to scale. The reform forces some of the older workers to stay employed rather than retire. This tends to increase output, but with decreasing marginal returns to scale in production, the marginal product of young workers falls and so does youth hiring. 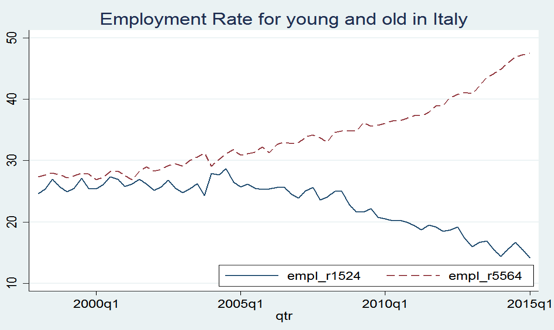 Second, there is an effect that depends on the degree of complementarity between young and old workers: the stronger the complementarity, the more likely that the reform could positively affect youth employment. Boeri, T., Garibaldi, P. and E. R. Moen (2015) “Graded security from theory to practice”, VoxEU.org, 12 June. Boeri, T. Garibaldi, P. and E. R. Moen (2016) “A Clash of Generations? 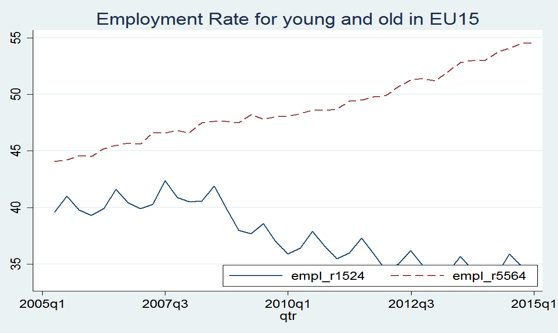 “Increase in Retirement Age and Labor Demand for Youth”, CEPR Discussion Paper 11422 and WorkInps Paper 1.